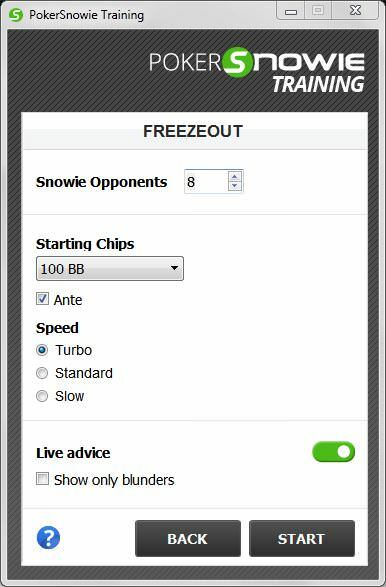 Today I downloaded PokerSnowie to see how it works and evaluate if it can help improve my game. What?! 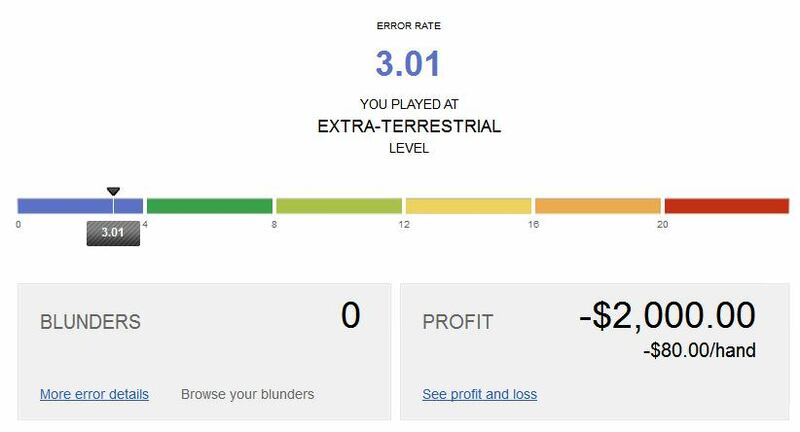 If I play breaking the rules (making "errors") and with an intermediate level (mediocre), that is, committing several "errors" and even blunders, I get better results than playing on an extra-terrestrial level. Playing near to perfection I lose money. Playing at a mediocre level I earn a good piece of cake. This is weird... Or is there something I'm not taking into account? The first thing that comes to my mind is that it is a very small sample of games that was analyzed. Maybe playing a thousand games in each mode would get different results. The problem is that the trial expires in nine days, and I do not have time to practice even one tenth of that amount. I will not draw conclusions yet. Tomorrow I will try cash tables with both modalities. And the day after tomorrow the Freezeout mode again. I have the impression that in the cash tables it is more important to faithfully follow the rules. Because I'm more interested in improving my Sit'nGo, I'm just going to evaluate the cash tomorrow only. 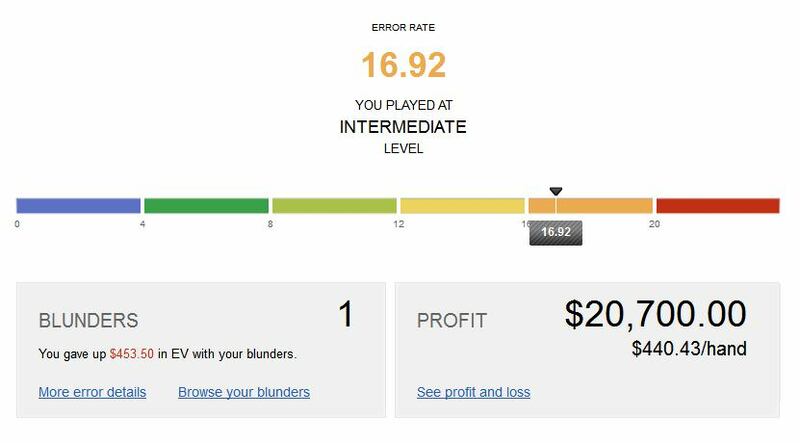 The only thing I can say up to now is that PokerSnowie thinks that my usual form of gambling in poker rooms is definitely mediocre (or intermediate, as they call it). Well, my banckroll is growing continuously, despite I play occasionally. I should not worry much, but in March I will devote more time to online poker, so I must think about the possibility of making profound changes to my style, but calmly. In any case, I have a personal preference with respect to learning, and it does not agree at all with what many pose. After finishing this PokerSnowie evaluation I will expose it. Yes, the time interval is too small to extract data from it . I don't think it's that easy . Do not forget about luck ! She plays a big part in the game . Sometimes from for it you play as . I know, I remember those tournaments in which I was already tired or bored, well below average, and I started playing nonsense, resulting in a monstrous climb on the list. Yep, AA can be defeated by a 72o. And can happen several times in a row. In on-line tournaments I always see those guys who are doing excellent and, suddenly, they make a serious mistake, losing a good piece of their pile and going crazy all-in creatures, resulting that they are soon on the top again. These "mother's trips" are very funny. Ups, where I did say These "mother's trips are very funny, must say Those "out of mother" are very funny. PS: To get out of mother is exceeding extraordinarily of the customary or regular. ... Well, if you consult the dictionary of the real Spanish academy you will see how mother is also the channel of a river and when a river overflows it is said that it has left its mother. Very interesting. It will be interesting to see how this develops. Is it published what a blunder and what a mistake is? Does pokersnowie use the same definition of a mistake that Sklansky defined? If so, then i wonder what a blunder is. Sklansky paraphrase: everytime you play a hand differently than if you could see the other players cards, you make a mistake. everytime your opponent plays his hand differently than if he could see your cards, he makes a mistake. I think we all appreciate Sklansky defining this for us, but there are so many ways to make mistakes. Sometimes we may intentionally make a mistake to set ourselves up for a future move. Keep in mind it's a GTO computer. Most players don't play like that. So even if your suboptimal play lets you win short term in this fake game of poker, that doesn't mean it will work versus real opponents. As wlad said: Yes, the time interval is too small to extract data from it . And myself: The first thing that comes to my mind is that it is a very small sample of games that was analyzed. And at the end of the same paragraph: Maybe playing a thousand games in each mode would get different results. The problem is that the trial expires in nine days, and I do not have time to practice even one tenth of that amount. So, Lorpugo, I would like you to contribute something that has not been said. Unless you have a sick and inevitable need to repeat what others say. In that case, keep going! As a fish, I say WOOHOO! I'm RIGHT! As a realistic poker player, you're mistaking good play for profitable play. The optimal profitability of poker doesn't come from playing the same way as everyone else (even if everyone else is playing the "correct" way). If everyone at the table plays the same way, then the entire game is left up to variance. Your optimal profitability is to play the opposite of everyone at the table, IF they are all playing identically. If everyone at the table is playing tight and you are bullying them out of pots, then you will be more profitable than if you just play tight and only take down the same number of pots as everyone else. With that said, if the game programs all its AI's the same, and you are playing against 8 AIs who play the exact same way, then you'll optimize your profits by playing the opposite of them. Now, as a professional fish I can warn you that the reason the strategy of, "Play the Opposite of the "Correct" way" does not work in real life is because not everyone at the table plays identically. So when you try bullying the tight player you end up getting caught by the loose player catching a good hand. But I bet if you played out thousands of hands against these same 8 AI bots you would be more profitable playing the second way simply because you are abusing their programming and playing opposite of the way they "expect" you to play. The way snowie was designed was to play im a style that is not exploitable. So you can throw whatever style you want at it, yes it plays tight, you can bluff it off hands, but it will not be beaten easily by trying to exploit its tendencies. Game theory is garbage. Exploitative is more adaptive to all the variables while game theory is theoretical and based off the cards. Also if your opponets are donks, kinda like me, game theory goes out the window. Snowie can help tell you where you missed value in your betting but I wouldnt use it for much more than this. Snow is a barrelling MOFO. Sometimes that will work but as someone already said its GTO. It is going to tell you that you missed value when you go for the exploitative check back. Thats not necessarily true, of course playing a GTO style will not be optimal against villains with explotatible tendancies, such as those who play wide ranges and call too much, or those who fold too much etc., but it will be a good base in which to deviate from when you have the proper reads in your opponent. You will run into some good players from time to time, and playing in the GTO snowie style will prevent you from spewing off chips by not over calling or folding in marginal spots. A blunder is just an error set above the blunder threshold, which is default at 1bb I think. Snowie defines an error or mistake as any desicion that does not give the best EV. So if you 1/2 pot instead of Full Pot and it thinks betting Full pot is higher EV play, it will say you made an error and tell you the EV difference between what it thinks is the optimal line, and the line you took, and other lines, such as folding, checking, 1/4, 1/2, Full, and 2 pot bet sizes. It gets its EV numbers from its own experiences from the trillions and trillions of hands it has played against itself and the people playing against it.